Is there anything more beautiful than spending Christmas in Chicago? The glowing red and green lights atop Willis Tower. The majestic snowflakes lightly dusting the Chicago River. And of course there’s the lighting of the Christmas tree in Millennium Park. 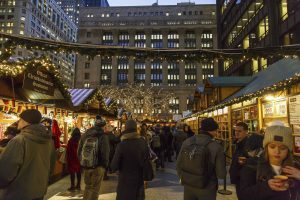 With Christmas right around the corner, there is plenty to see in Chicago. Be sure to check out these activities while enjoying your luxurious extended stay at the Walton Residence. This Christmas in Chicago tradition first began in 1996. The outdoor festival is modeled after the Christkindlemarket in Nuremburg, Germany and features traditional German foods and trinkets. This magical experience is perfect for families and curious travelers discovering new cultures. 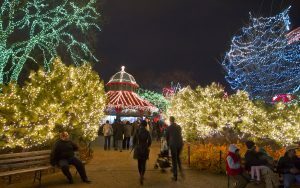 Lincoln Park Zoo is free all year round and every Christmas is a spectacle. Millions of lights are displayed around the zoo, so you can enjoy a joyous stroll indoors and out. Popular attractions include cow petting zoos, ice sculptors, holiday treats, and musical light shows. 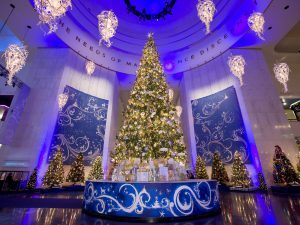 The Museum of Science and Industry features amazing displays for the holidays. As you walk into the Rotunda, your eyes will be dazzled by the 45-foot tree in the center of the room. Volunteers from all over Chicago come to decorate trees to represent different cultures around the world. With live musical performances and indoor falling snow, this is one holiday experience you won’t want to miss. Lastly, while you’re spending Christmas in Chicago, keep an eye out for Santa and his elves! 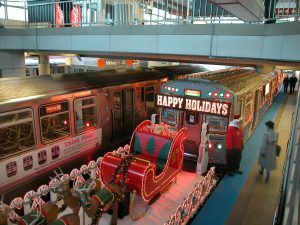 The CTA Holiday Train rides the L system five days a week until December 21st. Follow the link to find the schedule. Happy Holidays!